Is Andrew Bogut the best center named Andrew drafted in the 2005 lottery? Is Bogut a Top 10 NBA center? 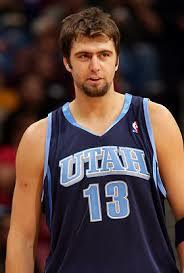 What does Mehmet Okur, the center for the Utah Jazz, get paid? These are things Bucks fans need to know as Bogut last week inked the five-year contract extension he more or less demanded from the Bucks. The agreement reportedly guarantees $60 million to Bogut over five years. Add Bogut’s $6.3 million salary, which is not part of the extension, and Bogut will be under contract for a guaranteed $66.3 million over six years, through the 2013-14 season. As projected back in April on the BBJ (almost to the dollar) that’s a fairly good deal for the Bucks, in line with the contracts of Sixers center Sam Dalembert, New Orleans’ Tyson Chandler and the Cavs’ Zydrunas Ilgauskas. But what about these “incentives” that could add $12.5 million to the guaranteed money, bringing the potential worth of the extension up to $72.5 million? That’s nearly the “Yao money” that the Bucks, as a lottery team, needed avoid paying a 23-year-old center with a lot left to prove. Sure, he can “prove it” earning those incentives, but why not just make all-star getting $12 mill a year? What more incentive is needed?” The incentives are “team-based and individual” according to Journal Sentinel, which didn’t cite a source for those details. Bogut’s agent later told Brewhoop that the incentives were along the lines of “play like Dwight Howard get paid like Dwight Howard.” Or, All-NBA pay. But enough about the contract. Without further ado, meet the inaugural Bob Boozer Jinx 2008 NBA center rankings. 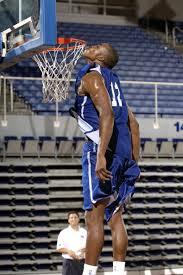 1) Dwight Howard, Orlando Magic. 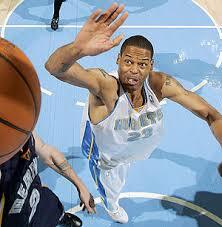 First team All-Pro; 2nd team All-Defensive; leading rebounder in the NBA three years running (14.2 avg. last season); 4th in blocked shots. Only 22-years-old and has not missed a game in his four-year career since being the 1st pick overall in the 2004 draft. Shot 60% from the floor last season (3rd in the NBA), but only 59% from the line, which hurt the Magic as Howard led the league in free throw attempts. “Hack-a-Dwight” is the new “Hack-a-Shaq” defense. Howard was 6-15 from the stripe against the Pistons in decisive game five against Detroit in the playoffs, which the Magic lost by five. Coulda made the difference. Howard this season starts year one of his five-year $85 million extension ($17mill avg), the max extension (CP3 got a similar max extension). He’ll earn $13.76 mill 2008-09. 2) Tim Duncan and his Spurs were tough enough in the paint to beat the Suns, and there’s nothing like Duncan magically transforming into Dirk Nowitzki to hit a game-tying three to demoralize the Suns in Game 1 of that series. Is Duncan a center? If Pau Gasol, who was pushed around all over the NBA Finals, is a center, so is Duncan, who plays the 5 much of the time in the Spurs dangerous small lineups, and is usually guarded by the opponents’ centers, such as Shaq. 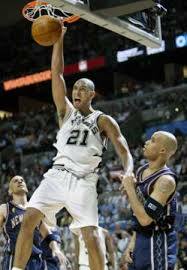 Duncan anchors the Spurs D in the paint and was first-team All-Defensive 2007 and 2008. Sounds like a center to me. At 7′ 0″ 248 lbs, Duncan is one of the best big men in NBA history. Averaged 19.3 pts and 11.3 rbs per game last season, 1.9 blocks, 7th in the league. Four championships. 31-years-old and plenty of gas left in the tank. Duncan’s salary is $20.6 mill this season. He’s set to make $62.2 mill over the following three years. 3) Amare Stoudemire/Shaquille O’Neal Stoudemire is no longer the Phoenix center now that Shaq is in the paint, but he’ll be called on to play the low post during the stretches of the season that Shaq is bound to miss. Phoenix acquired Shaq and fired coach Mike D’Antoni partly because of the lack of defensive toughness from Stoudemire and others (two straight playoff losses to Duncan Spurs didn’t help). Amare’s still one of the best scorers in the NBA around the basket. Averaged 26.7 points and 9.7 rebounds last season, earning 2nd-team All-NBA alongside Duncan as Yao slipped due to injuries. Soudemire’s contract extension was 5 years $72.6 million, $14.5 million per year avg. He’ll be only 28 years-old when he’s done playing out the remaining three years. Bogut can earn current “Amare money” if he makes the incentives in his contract. By the time Bogut’s extension is in effect, however, Stoudemire will be in the backloaded years of his contract, at $15-16 mill per. Shaq at age 36, is a part time player unless he comes roaring back next season to his 2006 form, which didn’t seem likely at the outset of 2008-09 but is beginning to occur now that he has days off. Shaq utterly dominated Bogut in a Nov. 8 Suns win in Milwaukee. doesn’t seem likely. Combining Shaq and Stoudemire at #3 may be cheating, but it’s as though Phoenix has a center-and-a-half. 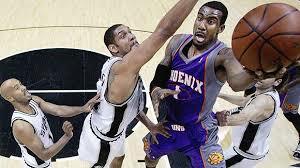 Few teams in the West are tough enough to compete with the Suns in the paint (Spurs, Rockets, Jazz). Shaq has lost a step but he’s still Shaq. No center who follows Shaq on this list has proven that he is indeed better than a well-rested 36-year-old Shaq. 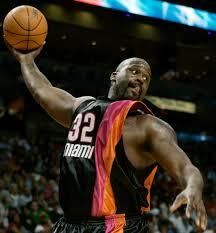 Shaq’s salary is $21 million per year through 2009-10. 4) Yao Ming. 3rd-team All-NBA last season despite missing 27 games. Six-time All-Star and 4-time All-NBA selection. 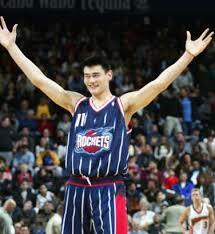 Yao’s a 22 pts, 10 rbs per game center who is, however, at 7′ 6″, 310lbs, not proving very durable. He’s missed 86 games over the last three years. Best free throw shooter among the centers at nearly 86% over the last three seasons. Not a shotblocker or a charge-taker, and could rebound more than he does for a 7′ 6″ guy. His Rocket teams win — 107 wins over the last two seasons — but his Rocket teams win just as much without him. 5) Pau Gasol/Andrew Bynum* Gasol is a gifted offensive player, but you’d almost have to put Kendrick Perkins on the list ahead of him after the Lakers were shoved around all over the NBA Finals by the Celtics. Still the Lakers went on a tear after acquiring Gasol last year and Gasol (18 pts, 7.8 rbs) will have Bynum to help him out in the paint next season. But really, Gasol is a lot more like big forward Dirk Nowitzki than he is like center Tim Duncan. * Bynum averaged 13.1 pts and 10.2 rbs until he hurt his knee (before the Gasol trade). After surgery this summer, he’s is a bit of a question mark (hence the asterisk and the double entry here at #5). Still, the Lakers should have few worries about the inside game next season. Bynum, the 10th pick in the 2005 draft, played strong against Bogut in their head-to-heads last season, with Bynum coming out on top. He’s considered by many around the league to be the best center from the 2005 draft. *Bynum has reportedly asked for a five-year $85 million extension, which would put him in the Howard $17 mill per year level. Good luck with that Andrew, as it looks like Chris Paul is the only player from the 2005 draft who’ll get Howard money. The Lakers will look to keep Bynum as close to Bogut’s $12 mill deal as possible, though Bynum still hasn’t proven that he can stay as healthy as Bogut. 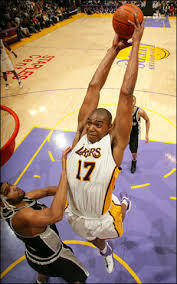 With the season underway, Bynum does not yet have his extension and will earn $2.8 mill 2008-09. Gasol’s contract is a guaranteed 6 years $86 million, a max contract that puts him in Stoudemire’s neighborhood. Like the Bucks max Redd contract, Gasol’s is backloaded – three years and $49.3 mill left to play out, a situation Bucks GM John Hammond was wise to avoid by keeping Bogut’s annual increases relatively flat. 6) Marcus Camby has never had much of an offensive game but has been one of those rare players who thrives on the defensive end. The Nuggets center last season led the league in blocked shots, was 2nd in rebounding to Howard and made 1st team All-NBA Defensive. Trouble is that after the playoffs, it’s difficult to tell where the Nuggets and Camby are at, or where coach George Karl’s head is at. Camby, for one, has been upbeat about next season. The oft-injured center outplayed his contract incentives for the first time, earning his full $11.2 million salary, with career highs in games played, minutes, assists, blocks and rebounds at age 33. I’d rank him ahead of Gasol but for that sweep business in the playoffs. 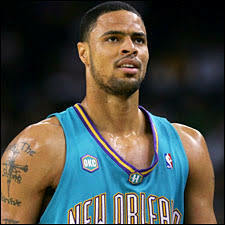 Camby was traded to the LA Clippers last July. Camby’s guaranteed $19.65 million this season and next. 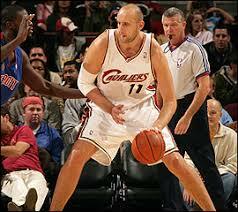 7) Zydrunas Ilgauskas. A tough spot to pick, as a combination of a good offensive-defensive game becomes a rare find in NBA centerville, which brings us to Cleveland, the best rebounding team in the NBA for a few seasons. The Cavs’ toughness starts with their 7′ 3″ center. After missing the better part of two seasons early in his career with injuries, Z has been a remarkably consistent scorer, rebounder and defender in the paint for Lebron James’ entire career-and-one. Ilgauskas can score 15 in his sleep off his rainbow set shot, still the most effective offensive weapon the Cavs have outside of Lebron. The James-Z offensive combo was probably not used as much as it should have been in the Cavs-Celtics series, but the Cavs showed that a championship is much more within their reach than many NBA wags had thought. (C’mon, the NBA wags had all but handed the title to the Lakers). At age 33, Z may only have a good year or two left, but experience counts. Bogut and many other younger centers haven’t distinguished themselves enough (or in Bogut’s case, have not outplayed Z head-to-head) to be ranked ahead of him. Ilgauskas took a pay cut in 2005 to stay in Cleveland, and this season enters year four of a five year $50.6 million contract. The final two years pay $22.3 mill. 8) Mehmet Okur began his career in Detroit but the Pistons couldn’t afford to keep him after winning the 2004 championship. No skin off then-coach Larry Brown’s nose as Brown often left 24-year-old Okur on the bench to keep Darko Milicic company during the Pistons playoff run. In Utah, Okur replaced big Greg Ostertag, still around from the Stockton-Malone years, and teamed with power forward Carlos Boozer — also acquired that offseason — to give the Jazz toughness inside to build around. By 2006 Okur was averaging 18 pts, 9 rbs per game. By 2007 the Jazz were back to the 50-win level and Okur was in the All-Star game. The knock on Okur is that he’s no shot blocker or great athlete; and who wants a center who shoots threes even if he is the best three-point shooting center in the league? (.388% last season, better than any Buck.) Utah coach Jerry Sloan, however, has played to Okur’s strengths — and there’s no denying Okur and Boozer’s toughness inside. Over the last two regular seasons, the duo has averaged about 20 rebounds per game. In the playoffs this year against the Rockets and the Lakers, they cleaned an average of 24.1 boards off the glass (Okur had 11.8 per game). They’re tough and it’s put the Jazz right on the Lakers’ heels in the West. Okur, 29, is a bargain in the center market with a 6-year $50 million contract. He’s set to make an average of $8.75 per year in the final two years of the contract, but the final year 2009-10 is a player option. With the Boguts, Dalemberts and Chandlers of the NBA making $11 million-plus by then, expect Okur to look for a nice raise. 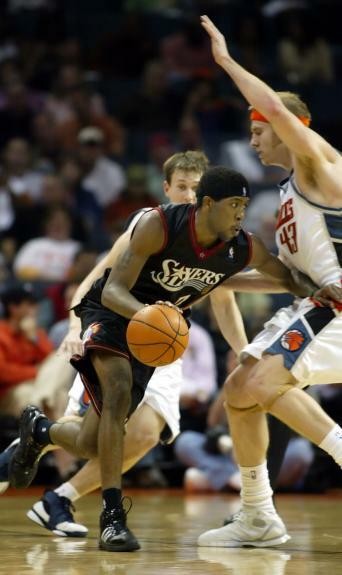 9) Sam Dalembert was drafted by Philly in 2001, at the height of the Allen Iverson/Larry Brown era, when the Sixers beat the Big Three Bucks in the East Finals and went on to play the Lakers for the title. After not playing much behind Dikembe Mutumbo his first year, he missed his entire second year with injuries, then came back to join the Sixers decline after Brown jumped to Detroit. He has yet to develop much of an offensive game to go with his sometimes dominating defense, yet it’s the defense and rebounding that has been pivotal in the Sixers turnaround, which was in the rest of the NBA’s face in the second half of last season. As a team, the Sixers can be defensive demons. Dalembert, 27, is entering his prime and hasn’t missed a start in two years, averaging 10.5 pts and 10.4 rbs (7th in total rebounds) last season. He was 3rd in the league in total blocked shots (2.3 per game). Dalembert has three years left on a backloaded six-year $64 million deal, and will be paid $36.4 mill in those years. This avg. $12 mill pay keeps him about $1 mill ahead of Bogut’s pay, though that narrows 2009-10 season. That might seem like a lot for centers who have never been all-stars and whose teams have not won a playoff series. But that’s the inflated market value that is the NBA. Sam hasn’t been the most popular player in Philly, and neither has his contract. Now that the Sixers have Elton Brand and could be contenders in the East, however, don’t expect many complaints about the center. 10) Tyson Chandler (Tie) came into the league out of high school and spent the first two years of his career looking absolutely lost on the court in Chicago, which had obtained his rights in a trade for Elton Brand. This was bad mojo in the post-Jordan Bulls era. Along came coach Scott Skiles and Chandler often found himself on the bench, counting his millions and taking on criticism that athleticism had been wasted on him. The Bulls signed declining veteran free agent Big Ben Wallace in 2006 and sent Chandler packing to the Hornets. In New Orleans, Chandler’s found a home and a role — dunking the ball off Chris Paul and Peja Stojakovic passes and tearing it up on the offensive boards. Chandler led the NBA in offensive rebounding the last two seasons; 2nd only to Howard last season in field goal percentage and 3rd behind Howard and Camby in overall rebounding (11.6 per game). So why is the ultra-athletic Chandler ranked behind Dalembert, Okur and Ilgauksus? First, he’s nowhere near the defensive presence Dalembert is, nor is he as mean in the paint as Sam; and he’s no shotblocker. Second, Ty’s got no offensive game to speak of, other than the aforementioned dunking. To his credit, Chandler is a hustle player who kills lazy rebounding teams and has thrived playing with CP3 in the West. But Hornets coach Baron Davis runs little or no offense for Chandler — no coach would. Against the Bucks last year Chandler averaged 17.5 pts, 15.5 rebounds in two Hornets wins. In a stretch last March, however, playing against the better teams in the East (plus Chicago and Indiana) Chandler averaged 11.6 pts (on his season avg of 11.8) but his rebounding was down three boards a game to 8.6. Still, the Hornets went 6-2 and split with the Celtics. Chandler, 26 next season, has a 6-year $63 million deal that he signed with the Bulls; it pays him $34.6 mill over the next three years just above Bogut’s guaranteed avg. salary over the next six. 10) Andrew Bogut (Tie). Bucks coach Scott Skiles would likely object to having his 23-year-old center in the same club with a guy who spent years in and out of his doghouse in Chicago. But that was then, this is now. Other NBA fans might whistle homerism and question whether Bogut should be ranked this high — his 14.3 pts, 9.8 rbs averages last season are no better than those of Kings center Brad Miller or Bobcats center Emeka Okafor, and short of Clippers center Chris Kaman’s; and Kaman blocked more shots than Bogut despite playing in only 55 games. But here’s where Bogut gets credit for toiling away on Michael Redd’s hapless Bucks; respect vs. West players for playing in the increasingly clogged paints of the slower-paced East; and where his passing skills earn some props. Tim Duncan and Paul Gasol may be the only centers on this list who pass as well as Bogut — Dalembert and Chandler certainly don’t. Bogut is tough to rate because his development and production have been hurt playing with uncoachable ballhogs his entire career. What he’s done is focus on one-on-one matchups with other centers, and worked to take care of business in the paint regardless of all the wrong play going on around him. 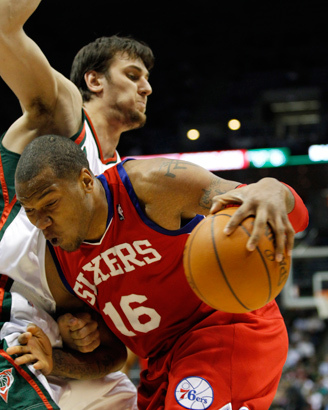 (Look out Sam Dalembert — Bogut’s looking for a few rematches.) 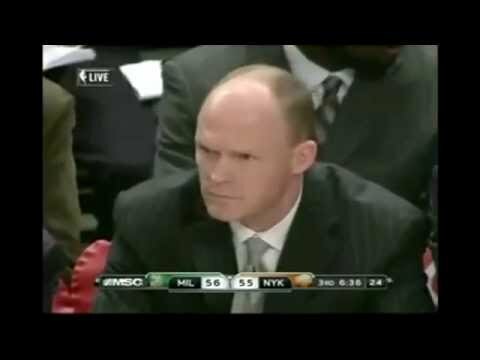 Skiles, of course, is out to fix the wrong that has been the Milwaukee Bucks. The team has only won 94 games since drafting Bogut #1 in 2005. Unlike Kaman, Dalembert, Okur and Chandler, players older than Bogut, there’s still plenty of upside left to Bogut’s game. Last season he finally had a head coach, Larry Krystkowiak, in his corner and made the biggest strides of his career, showing that the Bucks could run low post offense through him and win games (hence the tie with Chandler of whom the same cannot be said). In fact, the Bucks often struggled most when Bogut’s teammates freelanced away from the low post game plan. Defensively, Bogut made his biggest strides and a concerted effort to block shots (9th in the NBA); and was 3rd in offensive charges taken. The new “no flopping” rule shouldn’t effect Bogut because he doesn’t flop. He has taken a beating from opponents driving at will against the Bucks weak perimeter defenders. A big flaw in Bogut’s game has been his Shaq-like free throw shooting and lack of an outside shot – but then those are Howard’s big flaws too. Howard, Bogut, Bynum, Atlanta’s Al Horford and Portland’s Greg Oden (yet to play an NBA game) are the young centers to watch in the NBA next season. I’d keep an eye on Shaq in Phoenix, too. *Bogut’s guaranteed extension is 5 years $60 million, bringing his six-year total to $66.3 million. It seems that both sides in the Bogut negotiations came to the table understanding that Chandler and Dalembert money — $12 million in 2009-10 — was the fair and equitable base for Bogut. The $12.5m in incentives? It’s still not clear what those are but Bogut’s agent David Bauman mentioned Dwight Howard in saying that the incentives are, in part, based on all-star achievement. That’s misleading because the incentives don’t reach “Howard money.” They make Bogut’s possible avg. earnings $14.5 million per year — currently Yao-Gasol-Stoudemire money. Howard’s avg salary, $17 million, is the All-NBA standard for an extension these days. Should Bogut make 1st, 2nd or 3rd Team All-NBA in the next few years, that would mean the Bucks are winning a lot — and that the contract is indeed a very good deal for Milwaukee. Overall, I like the contract — it’s right in line with the market, including the incentives. In fact, I predicted the figures back in April. Then why does it still feel that the Bucks paid too much for their young center, steadily improving as he is, but with so much left to prove in the NBA? This entry was posted in Essential Reading and tagged Amare Stoudemire, Andrew Bogut, Andrew Bynum, Chris Kaman, Dwight Howard, John Hammond, Marcus Camby, Mehmet Okur, NBA Center Rankings, NBA Centers, Pau Gasol, Sam Dalembert, Shaquille O'Neal, Tim Duncan, Tyson Chandler, Yao Ming, Zydrunas Ilgauskas on July 10, 2008 by J.D. Mo. Long-term deal for Bogut: What’s it worth? Bucks center Andrew Bogut wants a long-term contract extension, up to five more years, and his agent this week said the Bucks and new GM John Hammond seem positive about getting a deal done. Bogut’s improved play and 38 double-double games being the bright spot in another dismal season, this qualifies as good news. So what is the 23-year-old Bogut — the 12th leading rebounder in the NBA, and an improved post player both offensively and defensively (9th in the league in blocked shots; 3rd in offensive charges drawn) — worth after three seasons? How much can the Bucks afford? The latter question is hardly complicated: the Bucks can’t afford much in the next two years given the salaries on the current roster. 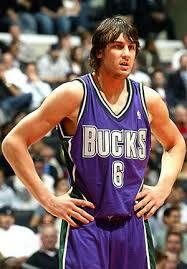 The Bucks have already picked up the fourth year options of Bogut’s and Charlie Villanueva’s 2005 rookie contracts. Paying them both will bring the Bucks right up to next year’s salary cap, with about $9 million or so to play with before hitting the league’s luxury tax limit, likely to be about $70 million. The tax is $1 dollar tax for every $1 dollar over the limit. Slickless Larry Harris had this all worked out. The Bucks were supposed to win this year and next year with the current roster, and Larry didn’t schedule in any of that “salary cap flexibility” GM’s desire. This means that there’s very little chance the Bucks will tear up the $6.3 million agreement for next season (they could). There will be no cap room in July to pay him more — unless Bobby Simmons suddenly quits to go play in Albania, which would free up $10 million. Or if Hammond trades Michael Redd for Miami’s lottery balls which would free up $15 million or so. Now to the question: What’s Bogut worth? Let’s start by looking at the top salaries in the NBA this season. As you can see, the All-Star, All-NBA centers and big forward/center types (Amare Stoudamire, Yao Ming, Paul Gasol, Rasheed Wallace, Chris Bosh) are grouped 20th-30th on the list, making between $13.1 (Bosh) and $13.8 million (Stoudamire). (Yes, they will all make less money this year than Michael Redd, believe it or not). Veteran champions like Shaq, Tim Duncan and Ben Wallace have much more lucrative deals, but their contracts won’t tell us much about Bogut. A center not on the list who will be next season: Dwight Howard of Orlando, the league’s leading rebounder for three years running and a near sure-thing 1st Team All-NBA selection. Howard made $6 million this year in his fourth year. Before this season, he was in Bogut’s contract situation, and the Magic extended his contract five years beyond this one for an additional $85 million. Howard, the #1 pick in the 2004 draft, creates a long shadow for Bogut (#1 in 2005) in this extension game. So does Yao Ming, who signed an extension with Houston for 5 years and $75 million in 2005. Yao at $15 million per year for five set the standard for young NBA centers in the extension era. Bogut doesn’t play at their All-NBA heights (among centers, only Stoudamire does and he’s moved to power forward on the Suns), nor to the level of the big men currently in the $13-$14 million range (Stoudamire again), nor can the Bucks assume he will be playing like a $13 million dollar star even in two years. As well as Bogut has played at times, would you want to bring the Bucks 54-110 record over the last two years to the bargaining table? The Bucks can look at New Orleans’ Tyson Chandler’s $10.5 million in 2008 and say, “Chandler’s the 3rd-leading rebounder in the league, and the Hornets are winning in the playoffs.” It’s arguable whether Bogut is underpaid. Where does the league’s 12th leading rebounder on a losing team fit in? Because of his young age, Somewhere in line with Chandler’s six-year $63 million deal, which, only two years ago was considered a glorious waste of money in Chicago. Cleveland Center Zydrunus Ilgauskus will make $10.1 million this year. At 32, Ilgauskus may be on the down side in his career, but he outplayed Bogut two of three games this year (the game logs at basketball-reference.com ain’t pretty). Bogut should surpass Ilgauskus soon, but next year? Or the year after? Philadelphia’s Sam Dalembert, who dominated Bogut defensively in three of four games this year, has a six-year $64 million deal. At $10.25 million this year Dalembert’s right where he should be in the Ilgauskus-Chandler range — though many in Philly view him as overpaid. And Dalembert’s a much better defender than Bogut. Bogut has improved each year, true, but he’s only recently moved up among the Top Ten centers’ in the league, and he’s much closer to #10 than to Howard at #1. Like it or not, Dalembert and Ilgauskus are Bogut’s peers in the Eastern Conference paint. If the Bucks can keep the first three years of the contract extension in the $10-12 million per range, they’ve got a good deal. Over five years — what Bogut wants — the Bucks should look to keep it around $60 million. At five years, $65 million, a Bogut contract begins to look too lavish for what he’s accomplished. Sure, if Bogut’s a mutliple-time All-Star by 2011 and 2012 when Bogut is 26-27, in his prime — and the Bucks are winning — $13-14 million a year won’t look so gaudy. But that’s a big “if.” Sign Bogut at $70 million for five years now and fans will ask why he’s getting a contract in Yao’s neighborhood. There’s no reason for Hammond to break the bank, not now with a player who still has much to prove on a team that is still so incomplete. The Bucks will need plenty of salary cap space to grow in the years-to-come; it’s a good time to find out how serious our 23-year-old center is when he says his goal is to win in Milwaukee. Leave it to the sports agent to start an argument, especially with CP3’s MVP-like season, Deron’s All-NBA year and Laker fans talking up injured Andrew Bynum as the best center of the 2005 draft (and worried whether he’ll ask for a $75 million-plus extension this offseason). It’ll be interesting to see how Bynum and Bogut’s contract extensions pan out. And leave it Foxsports-australia to ramp up Bogut’s contact numbers. In its coverage of this story, fox-aussie pegged Bogut’s new contract “in the region of $63-79 million.” The headline? “Bogut to earn the Big Bucks” … Fox does realize Larry Harris was fired, don’t they? This entry was posted in The Jinx and tagged Andrew Bogut, Andrew Bogut contract, Chris Kaman, Dwight Howard, John Hammond, Marcus Camby, NBA Centers, Sam Dalembert, Tyson Chandler, Yao Ming, Zydrunas Ilgauskas on April 24, 2008 by J.D. Mo.